Do you want to set up a search box (or even hundreds of search boxes) over a subset of your content? You can set up a Collection. Or, you can now pass in a ‘sitelimit’ parameter to filter the results to specific folders or domains. 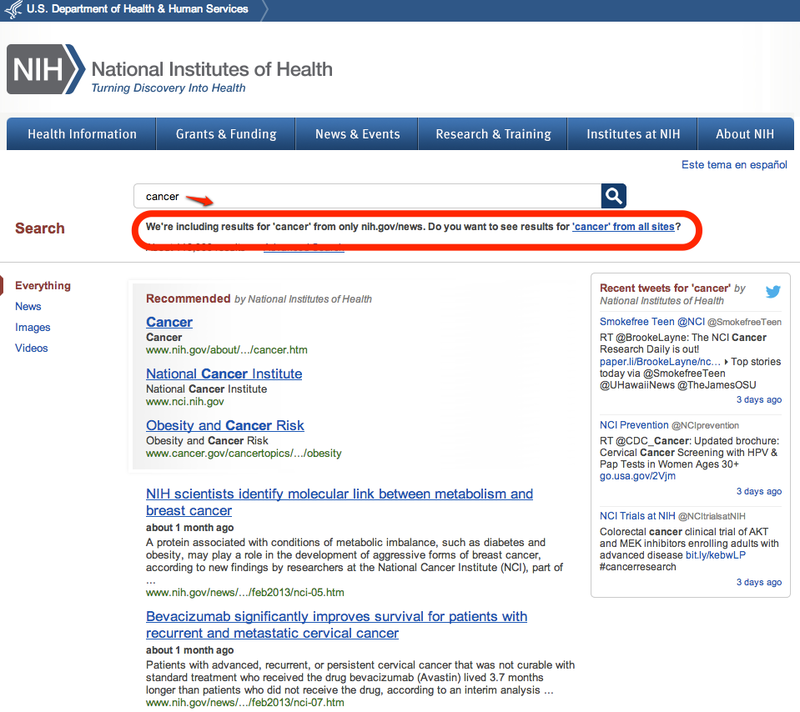 See the sample results page on NIH.gov that shows results for a search on cancer in NIH.gov’s New Releases. Note that the searcher sees that results are filtered to News in the left-hand menu. Compare the collection-based results above with the results for the same search using the sitelimit parameter. 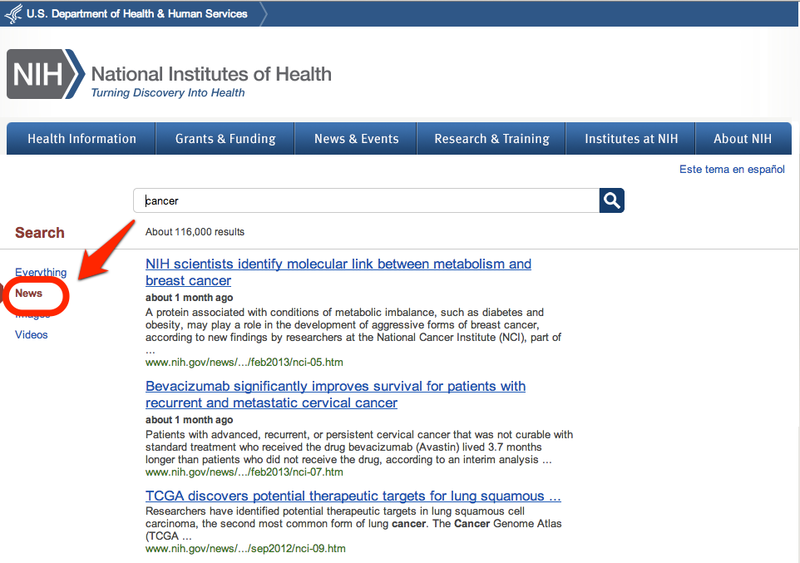 Note that the searcher sees that results are filtered to nih.gov/news in a message under the search box, among other differences. Do you have information in the footer of your results page that searchers need to see? Searchers can now view or hide the footer while on your search results page. After clicking on the Show Footer icon located at the bottom right-hand corner of the search results page, searchers will see the footer. They’ll still be able to scroll infinitely through the search results while the footer is visible. To hide the footer, they can click on the icon again. Searchers’ see job openings in their state before the listings for jobs in other states. We automated the syncing of our geolocation data. We published instructions for the Jobs API. We migrated our website platform from Tumblr to GitHub Pages. We set up a cron job to regenerate tagged pages after commits for our website. We published an RSS feed for our website. We added sequester/sequestration as an entry in our synonym file so that searchers looking for information on the topic find all relevant results. We throttled the YouTube RSSFeedFetcher to avoid HTTP 403 errors. We added some compound indexes to speed up queries. We added JSONP support for the Jobs API and Recalls API. We investigated additional sources for jobs openings, such as the Department of Labor’s Summer Jobs and the National Resource Directory’s Veterans Jobs Bank. We moved the publishing platform for USASearch.HowTo.gov from Tumblr to Github pages. Searchers see a tool tip for the icon that toggles the display of the header and footer. Searchers no longer see an unescaped HTML tags. We reduced the file name maximum size in our ActiveSupport FileStore cache. Visitors to eForms.gov, FedForms.gov, and Forms.gov are now automatically redirected to the USA.gov’s list of government forms by agency. We tuned the redirect on search.usa.gov/images so that all needed images show up on results pages.